Having only released their debut LP You Tried earlier this year, Hater’s EP Red Blinders, four new songs, might well have them marked down as prolific. As on the LP, Hater have delivered a set of dreamy upbeat songs that subtly disarm and charm the listener into submission rather than bowl them over with power or volume. The understated nature of the music is a running theme through the four songs that make up this EP, the first to be released in the UK by the Malmo, Sweden based four piece. There’s a warmth to the likes of opening track Blushing and an inordinate amount of space left for Caroline Landahl’s vocals to weave their magical spell, her intonation and emphasizing delicately every word she sings. It’s a theme that runs through the other three tracks yet Hater manage, as they did on the album, to avoid this ever sounding like they’re repeating the same trick even though they’re using the same means to wriggle a way to your heart. Rest gives Caroline a sparse drum beat and a repetitive but intoxicating riff over which to weave her spell before a middle eight that has you wondering whether the needle’s stuck before the gentle wave of the last chorus washes over your feet. In many ways it’s ridiculously simple in its execution but it hits the spot dead centre. The EP’s title track feels like it’s transported you to a dream like state. The chiming guitars and the lift in Caroline’s voice are almost reticent as they slowly and unwittingly seduce you as she wraps her way around the words to the extent they could be singing anything and you’d still swoon involuntarily. They save the best for last though, an eponymous song (strange in the sense that they’re an EP and LP into their career). Set to a restless persistent rumble, Caroline implores the song’s subject to “keep coming back.” You can almost feel them resisting the urge to let loose and it’s that tension that holds your attention. 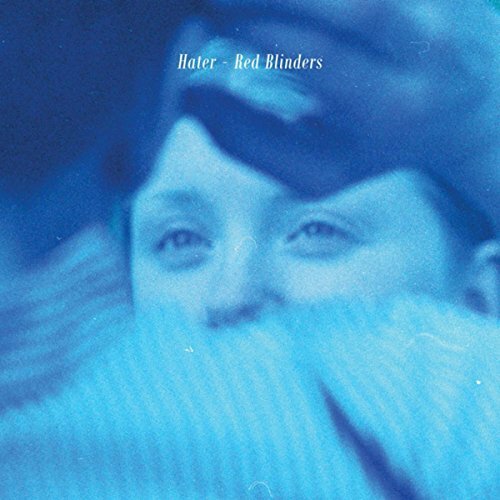 Red Blinders is a beautiful record that’s unassuming and uncluttered in its approach, confident in its own fragile skin and devoid of any pretence. Its simplicity and honesty are its biggest virtues and as the listener you can let it wrap itself around you and make you feel warm inside. Hater are on Facebook and Twitter.